what-i-found: These are not the Barbies you are looking for. OK, these outfits are weird enough...but look at the dolls! I think these were all Barbie knockoffs and I'm sure that first guy is NOT Ken. These pictures gave me a bit of a chuckle. 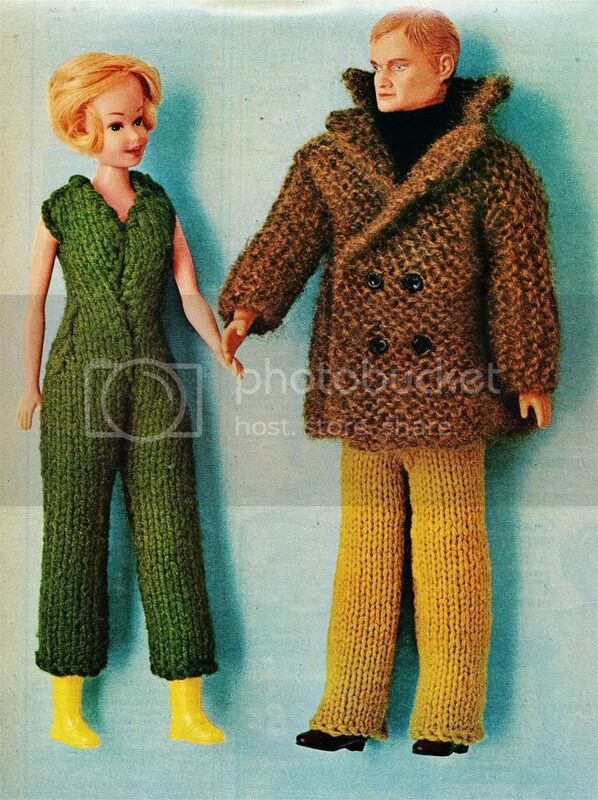 I had a fake Barbie in the 60s, and she had some clothes knitted by my mother. 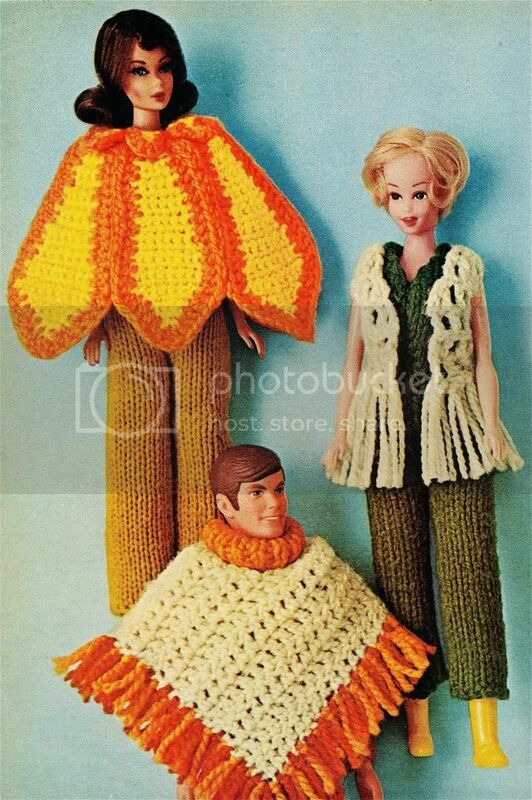 Like some of these, the yarns were totally out of scale, so the clothes weren't very convincing. Yes, I could really go for a man on orange combinations. Haha, I had fake Barbies. I think the first guy is the blond guy from Man from U.N.C.L.E. - Ilya something? His girlfriend definitely looks like a knockoff. The 2nd two look like a real Barbie and Ken to me, and the last girl is a Julia doll. That orange jumpsuit is hysterical! Yeah, I agree, after a closer look there are a few real Barbies and Kens in there. But in the article they are never mentioned by name, I'm sure it was a copyright thing. But I had no idea who that first guy was. I didn't think he was a G.I. Joe. But I didn't remember there were 'action figures' for Man from U.N.C.L.E. - even though we played that a lot. Wove fantastic stories about it, even though I suspect we weren't allowed to ever see the show, it was on late. And I don't remember anything about the actual show, but man, did we have spy adventures! Go poncho go! 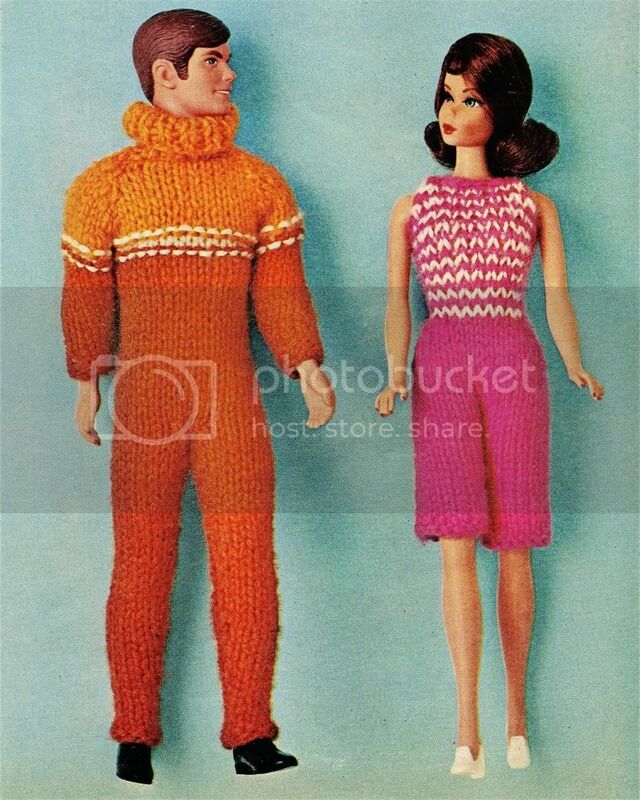 I hope I never see a full sized version of the orange knit jumpsuit with a turtle neck. Wow! This is an interesting find! Brings back way too many memories of homemade Barbie clothes, though...and a home made Barbie! Thanks for posting this...my smile for the day! I had to post the first photo on facebook (w/ a linky to your blog, of course) - I labelled the male doll "Angry, Angry Ken". He may not be Mattel but he's one unhappy camper, obviously. Thanks for the wonderful posts! Ah, thanks. That was nice of you, and this was a fun post. I. LOVE. THESE. So crazy! I think the first Fake Ken looks like Quentin Tarantino!